What a great piece of furniture! 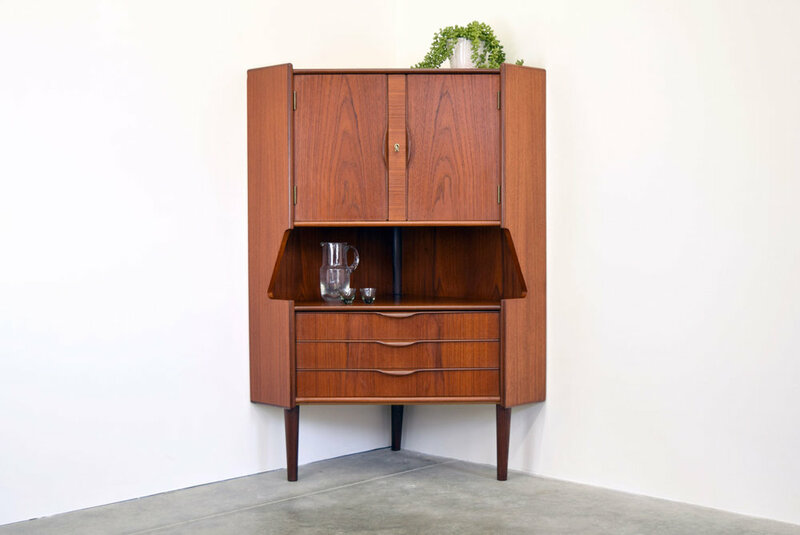 This teak and afrormosia corner bar cabinet was designed by Gunni Omann and produced in Denmark by Omann Jun. 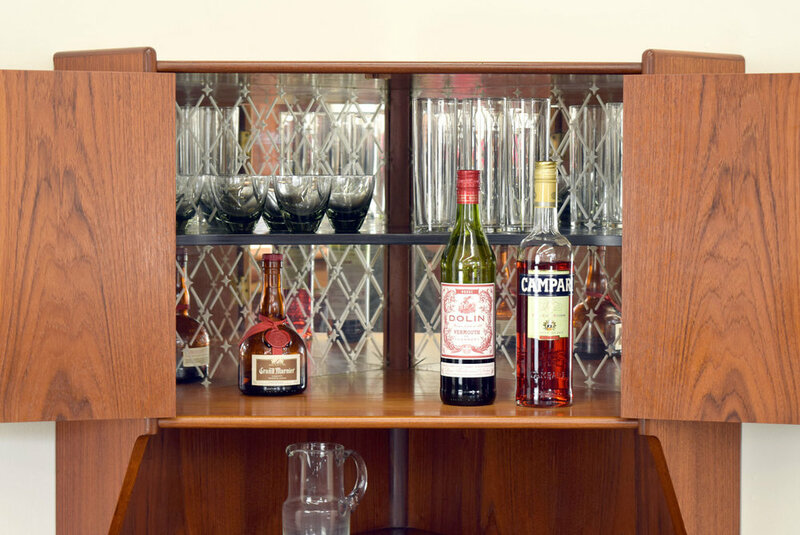 The locking top cabinet features fabulous etched mirrored glass and a shelf designed to allow tall bottle storage at the front. 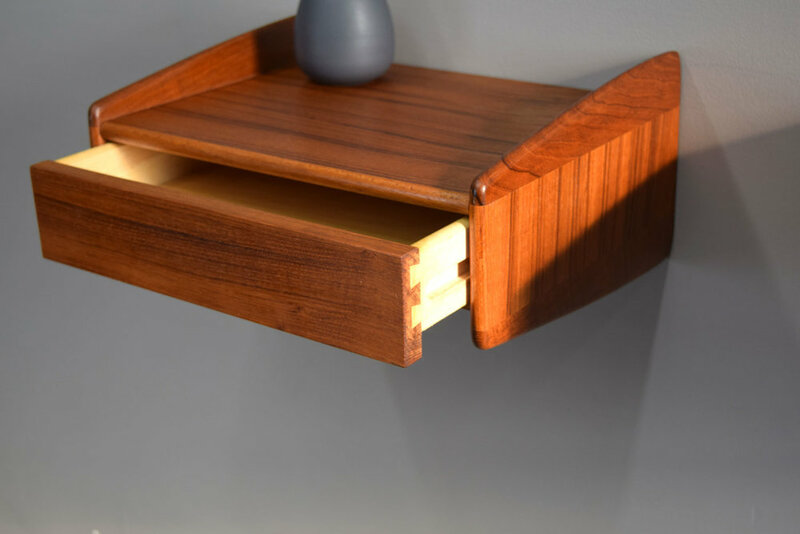 Below are three dovetailed drawers. 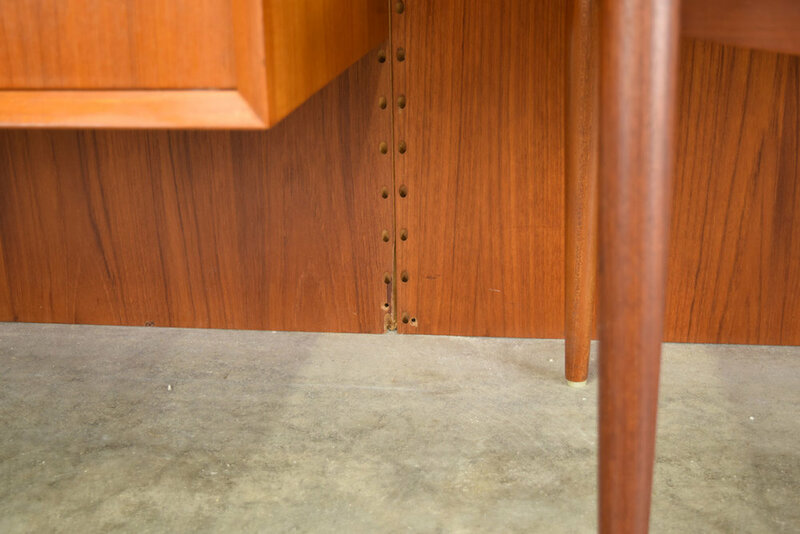 We love the bookmatched teak and jaunty details! 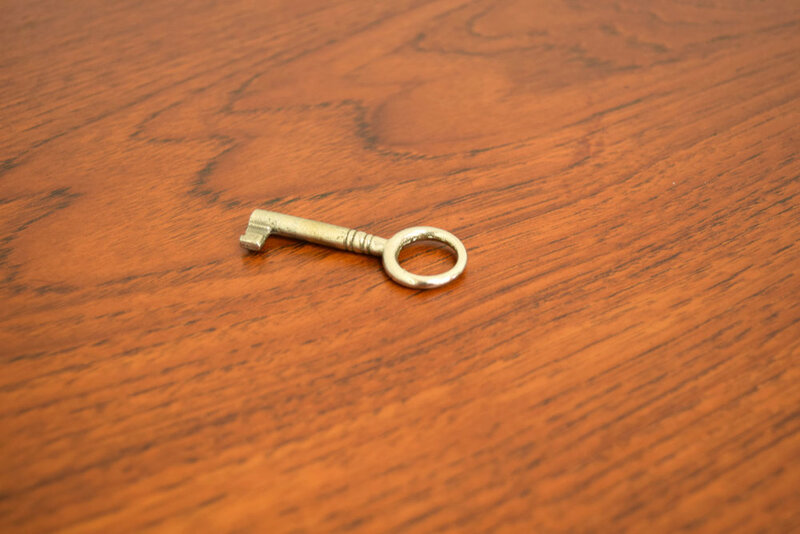 This piece is in excellent vintage condition with a gorgeous patina. There are only a few minor scratches. The top left back corner and top very back corner have small chips as shown. 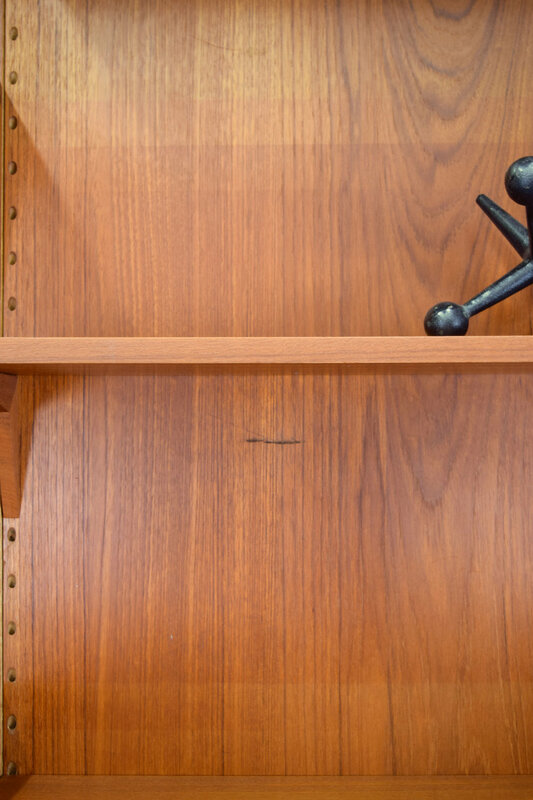 This is a wonderful, rarely seen modular storage piece by renowned Danish designer Hans J. Wegner for RY Møbler. 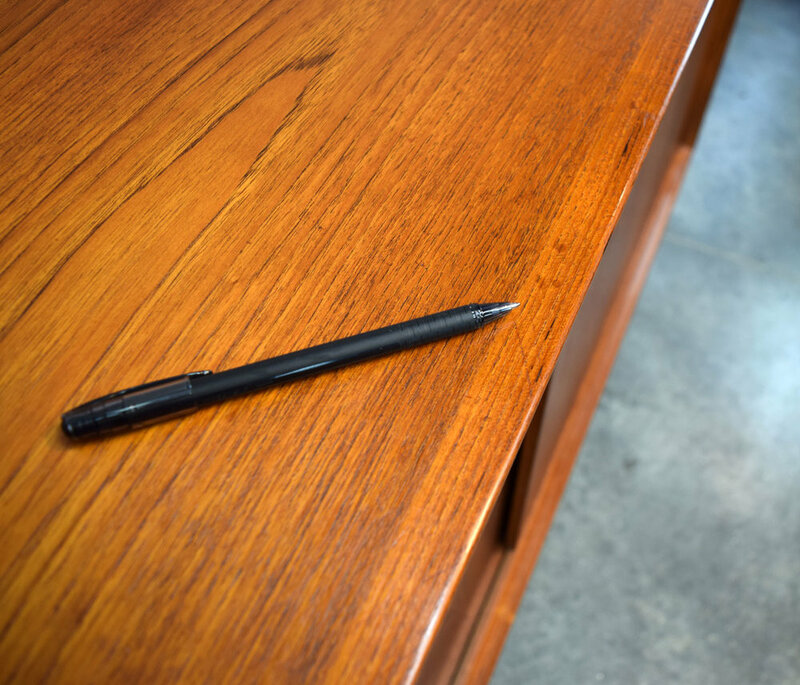 It is beautifully crafted with rich teak exterior and an amazing contrasting interior. Part of the RY100 modular system that allowed infinite combinations of cases, cabinets, and shelving. 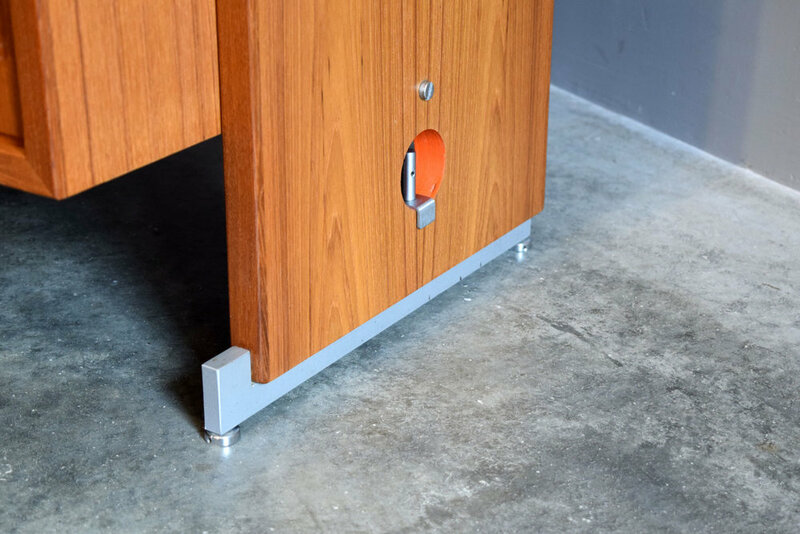 It features beautiful milled aluminum bases with adjustable stainless leveling feet and the fabulous orange keyhole joining system on each side. It is gorgeous on its own, or could be combined with other pieces from this system. The back is finished for use as a room divider. This unit features two cabinets, both with sliding doors. 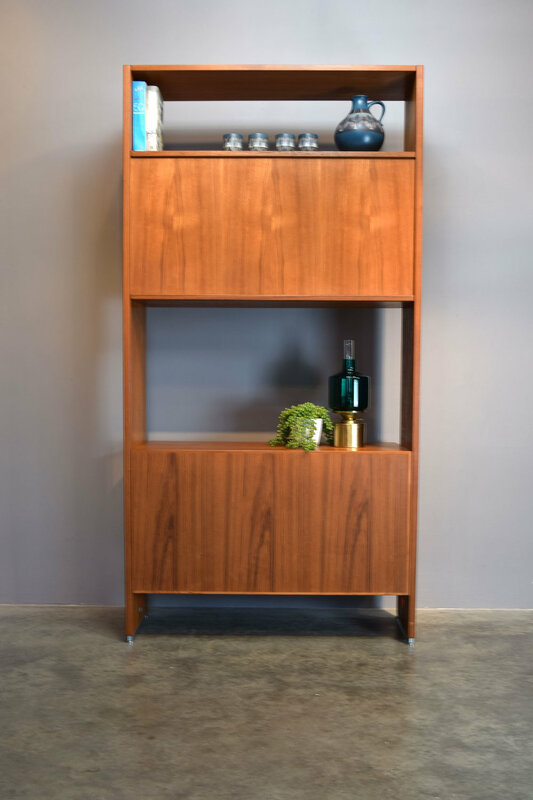 The lower cabinet has beautifully detailed teak doors with raised panels and a stunning spalted white oak interior; the upper has sliding glass doors and a teak interior. 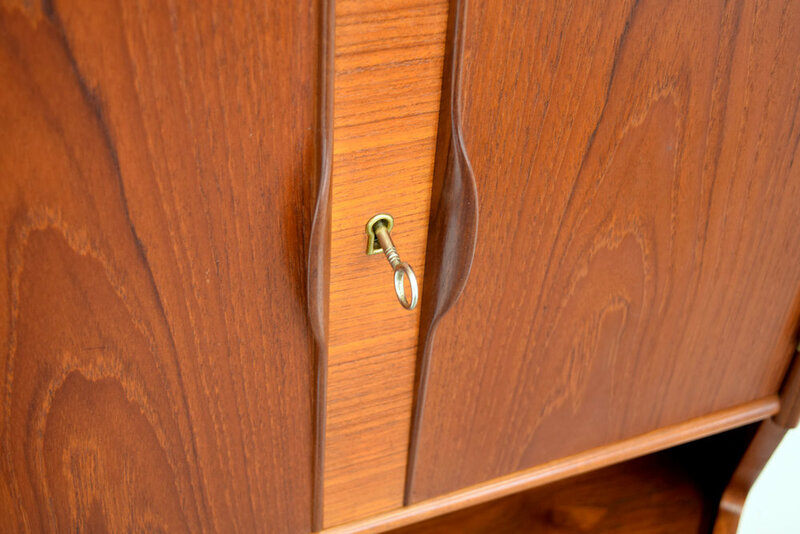 The cabinets can be adjusted up or down as desired. 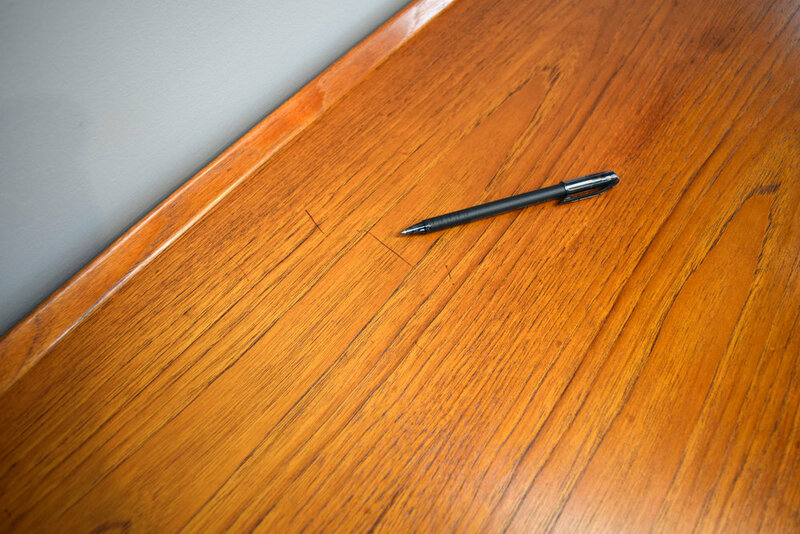 This piece has been very well cared-for and is in excellent vintage condition. There are a couple of small dings on the case edge. 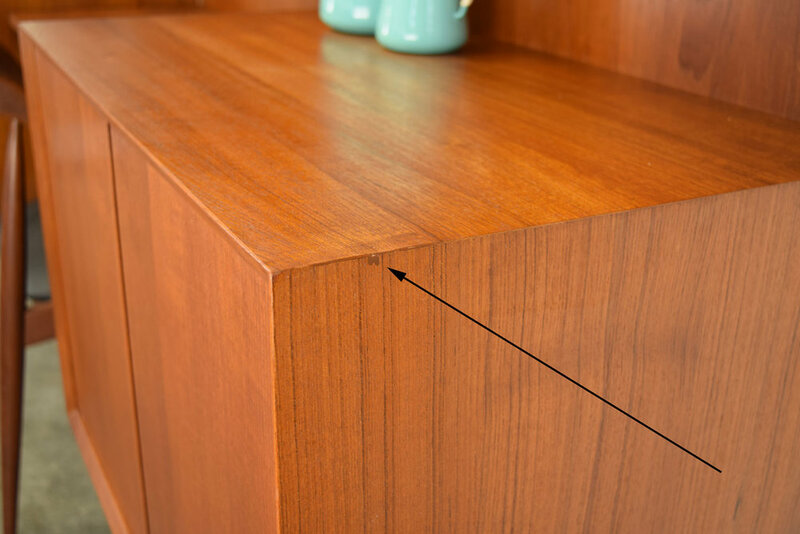 There is an area of scratches on top of the lower cabinet. The top right edge of the upper case has a few chips. 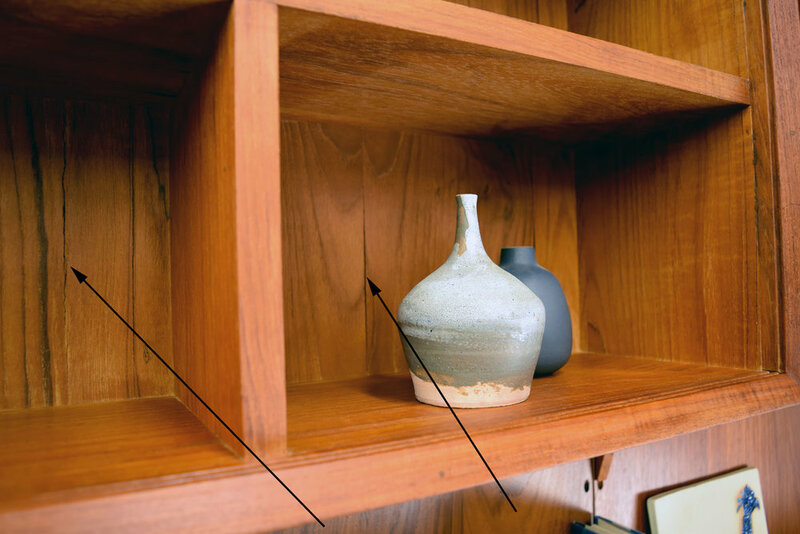 There is a slightly lighter area on the left side where a custom-mounted light fixture blocked sunlight for years. 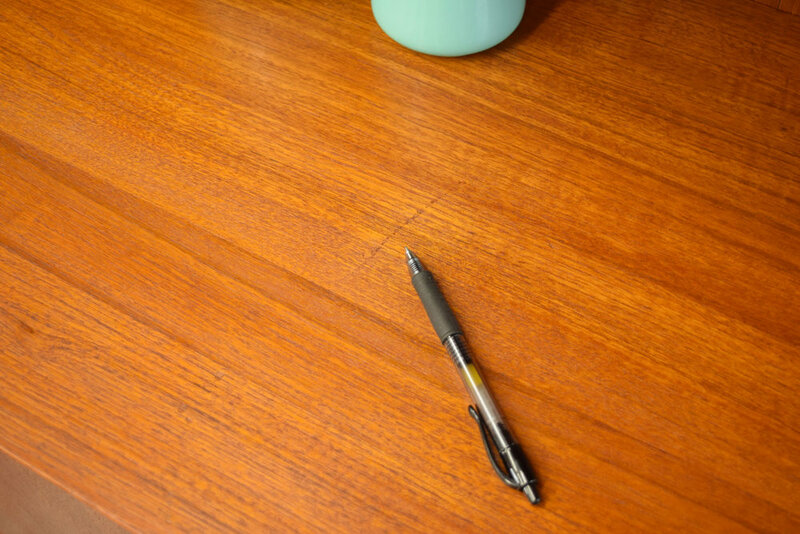 it is not very noticeable and will even out over time. 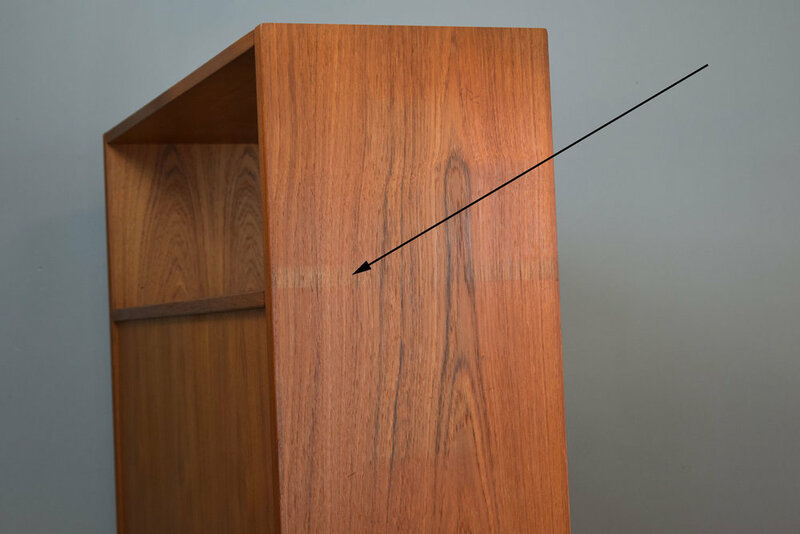 The light, a Shoji-style Lightolier with custom brass bracket, is also available if desired. Please see last 2 photos. 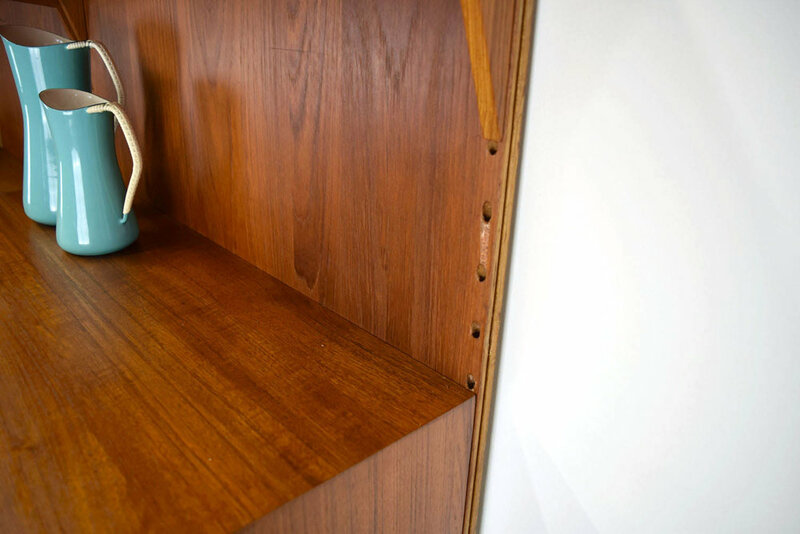 A hard-to-find pair of floating wall-hung teak shelves with drawers, by Melvin Mikkelsen circa 1950s Denmark. beautiful, sculptural lines and a great patina. Excellent vintage condition with only the most minor signs of age. These were sourced from a recent estate auction in Denmark. 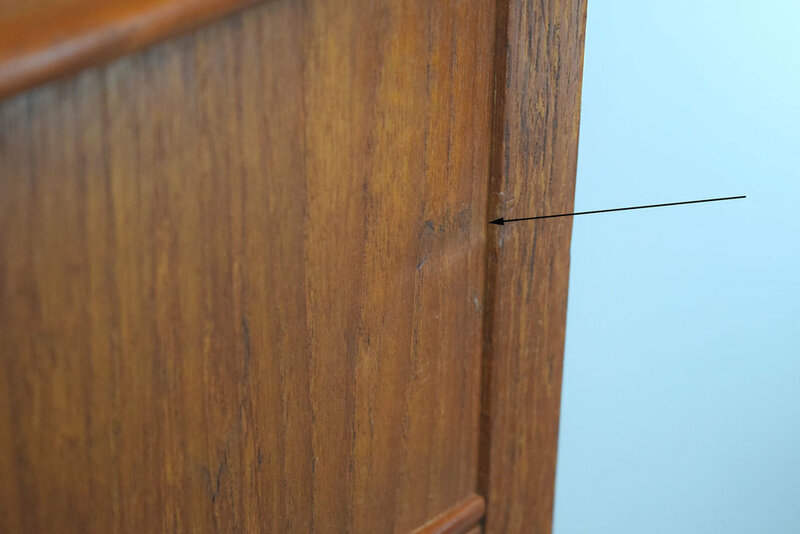 These hang on the wall with keyhole slots: in drywall, install drywall anchors and large-headed screws, slip onto slots and tighten. 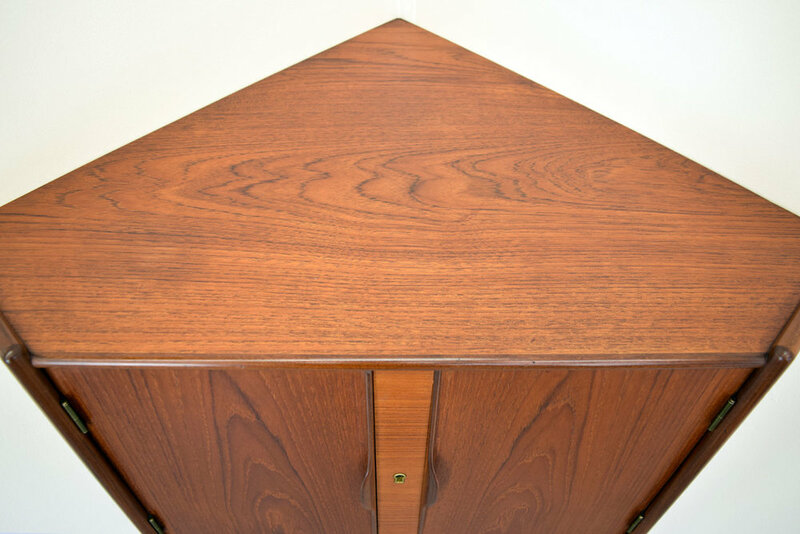 This is a truly outstanding piece of 1950s Danish teak, with gorgeous details -look at that carved back lip on the top!- and a wonderful, rich patina. It was designed by the renowned Danish designer Arne Vodder and produced by Sibast Møbler in Denmark. The No.11 Sideboard is perfectly sized for a smaller home. 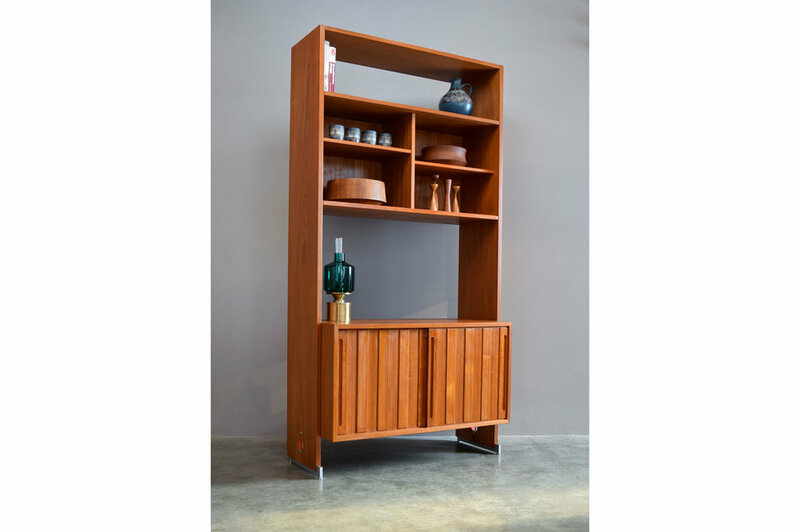 It features two sliding doors with a large storage section with an adjustable beveled-edge shelf, and a section of sliding drawers which can be configured to various heights depending on your storage needs. 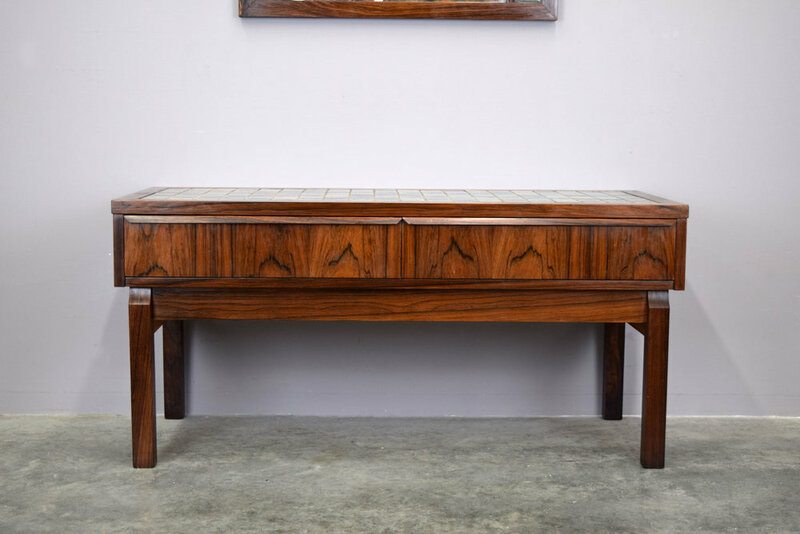 It is very finely crafted in beautifully aged teak. This exquisite piece is in very good vintage condition with age-appropriate wear and a gorgeous patina. 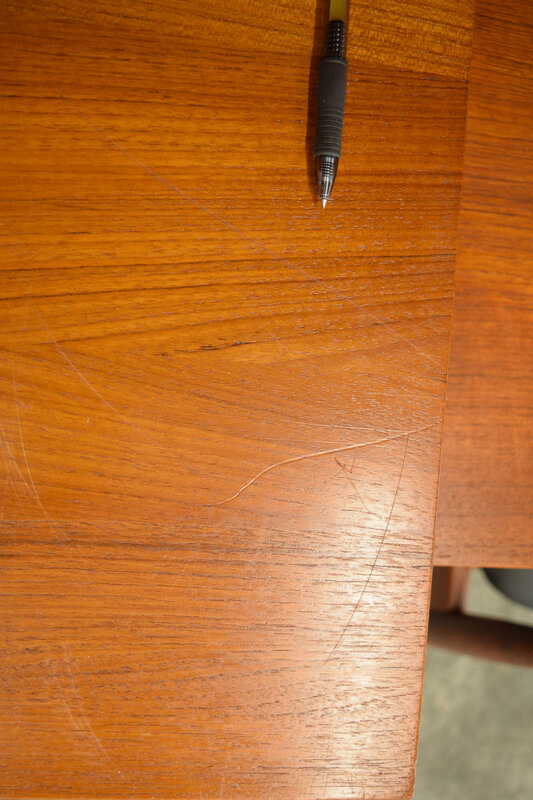 There are a few scratches on the top as shown, and a spot of slightly lighter wood on the bottom front edge of the case. 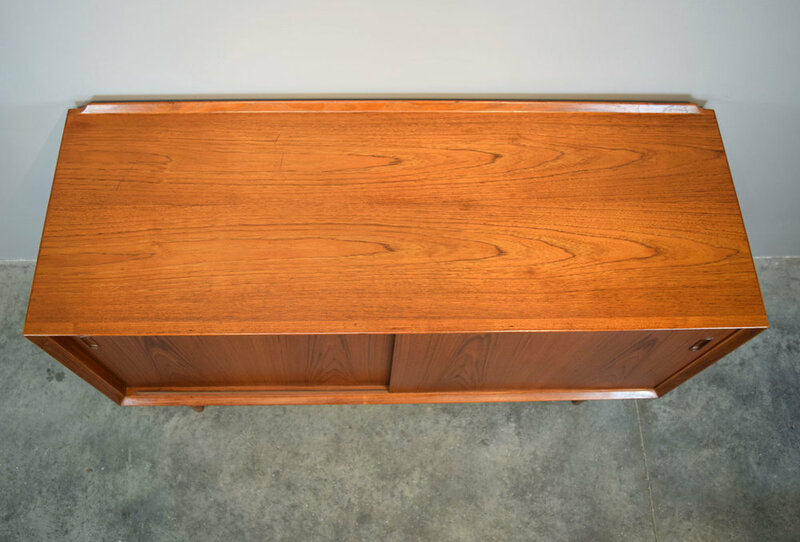 A very lovely mid-century teak dresser with carved handles in an organic undulating wave shape. Lovely matched veneers in glowing old growth teak with beautiful patina. 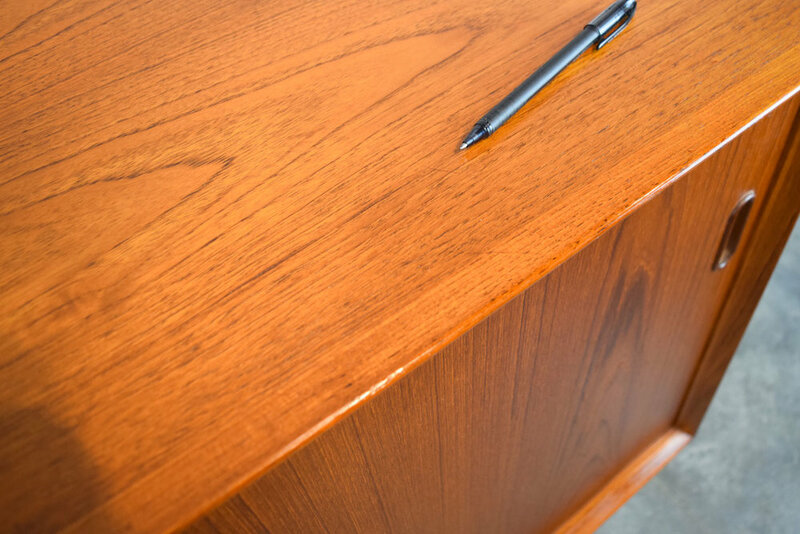 This piece is in excellent vintage condition with age appropriate scratches/dents including a dented area to top drawer, repaired split bottom right corner of case, veneer chips back side left corner, light scratches/stains to top.